Nevada Department of Transportation A portion of Nipton Road (State Route 164) was closed Aug. 15 following flash flooding. The road is now open, though a pilot car will lead traffic through the area. The Boulder City Primary Care Clinic is now open at 999 Adams Blvd., Suite 102, next to Boulder City Hospital. According to Tom Maher, CEO of the hospital, the clinic will provide primary and urgent care. The clinic is open from 1-4:30 p.m. Monday through Friday. Appointments are preferred, but walk-ins are welcome. Maher said the clinic plans to expand its capacity as soon as possible. To make an appointment, call 702-698-8342 from 8:30 a.m. to 5 p.m. weekdays. Fall’s arrival has brought several changes to the use and availability of trails and campgrounds at Lake Mead National Recreation Area. Goldstrike Canyon and White Rock Canyon/Arizona Hot Spring Canyon trails reopened Monday, Oct. 1. The two strenuous trails close annually during the summer to help ensure public and employee safety. A new parking area has been created near the Interstate 11 Hoover Dam exit for Goldstrike Canyon, making it easier for vehicles to access the trailhead. Addtionally, a new sign has been added near the top of Goldstrike Canyon Road. It includes a downloadable trail map and information about the area. The 5-mile round-trip hike at Goldstrike Canyon requires rock scrambling and climbing. It leads to hot springs and the Colorado River. The area known as White Rock Canyon has multiple trails leading to the Arizona Hot Spring, Liberty Bell Arch and Colorado River. When hiking, visitors are reminded to be aware of changing weather conditions. The temperatures in the canyons can be 10-20 degrees warmer. They are also in washes, which may flood during heavy rains. To view a full list of the park’s trails, visit www.nps.gov/lake/planyourvisit/hike.htm. Seasonal fire restrictions, which were implemented June 1 throughout Southern Nevada, were lifted. Fires are permitted in Lake Mead’s backcountry. However, there are limitations regarding size, location and disposal of ashes. n Fire size must be less than 3 feet in diameter. n Fires must be at least 10 feet from the nearest beach logs, structure or vegetation. n Chemically treated wood, painted wood, wood with nails or staples shall not be used. n Fires must be above ground (no pit fires) and attended at all times. n Fires must be completely extinguished with water, doused and stirred. Fires should not be covered with sand as it will insulate the heat and create an unseen danger for wildlife and visitors. n Rock rings must be deconstructed and refuse must be removed from beach. n Debris burning is not permitted. n When shoreline camping, all charcoal ashes must be packed out and disposed of in park trash receptacles after ensuring that they are completely extinguished. Several seasonal restrictions for watercrafts are now in place at Black Canyon, which extends from Hoover Dam to Willow Beach. Houseboating, water-skiing and wakeboarding are prohibited year-round for safety reasons. Vessels with motors are prohibited Sunday and Monday year-round. Boating is restricted to vessels with 65-horsepower engines or less Thursday-Saturday until the Saturday of Memorial Day weekend. Personal watercraft are prohibited daily until the Saturday of Memorial Day weekend. A portion of Nipton Road near Searchlight that was closed after a flash flood has reopened to public traffic. A pilot car operation remains in place, according to the Nevada Department of Transportation. 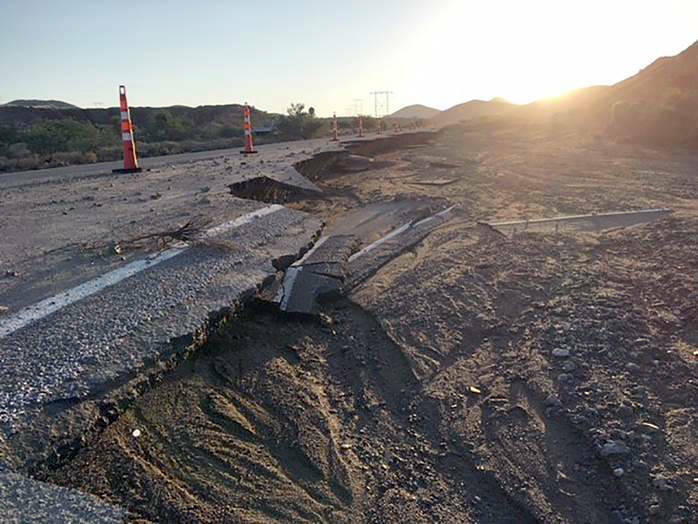 An Aug. 15 storm washed away portions of state Route 164 between mile markers 2 and 6, which was repaired by Las Vegas Paving through a $3.45 million emergency contract. The two-lane 18.6-mile-long roadway connects U.S. Highway 95 in southern Clark County, near Searchlight, to Nipton, California. The improvements began Sept. 4 and are expected to be complete in early November. Repairs will include a new roadbed, asphalt paving and installing new precast concrete box culvert for enhanced storm water drainage. The Nevada Department of Transportation is seeking public comments on its draft of the One Nevada Transportation Plan that will guide future state transportation investments and strategies. The plan puts a clear focus on transportation for the next 20 years and beyond for the entire state. NDOT gathered information on top priorities for future improvements, system goals and funding, which were incorporated into the plan. “Whether enhancing transportation safety, reducing congestion and travel times, expanding the transportation system, maintaining and repairing the state’s infrastructure or providing more transportation choices, we want to know what is most important to all of those using Nevada’s transportation system,” NDOT Assistant Director of Planning Sondra Rosenberg said. Those interested in viewing and commenting on the plan can visit www.onenvplan.com. Comments must be submitted before Oct. 29 via email to info@onenvplan.com or by mail to 1263 S. Stewart St., Carson City, NV 89712 ATTN: Tim Mueller, room 320.